Dies & Bushes by Regal Carbide Dies Pvt Ltd.
RBD machines imply Rod break down machine. This machine is used for the wire drawing of copper or aluminum wires in high speed in a series of wire drawing dies. Generally a series of 9 dies, 11 die, 13 die or 15 die machine is used in India. With ever increasing demand for wires, these machines have good wire drawing speeds. Diamond wire drawing dies are preferred because of extremely long life and good surface finish on the wire. For Aluminium wires , the wire rod size is 9 mm , and for copper rods the size is 8mm. These RBD machines are designed for a reduction range of 18 to 24 percent. Wire drawing dies at a certain specified reduction percentage should be used for smooth wire drawing of the wires. We at Regal Carbide Dies Pvt Ltd , are suppliers of these PCD wire drawing dies for RBD machines. We have many satisfied clients . Labels: Diamond Dies, diamond dies for RBD machine, dies for RBD, PCD Dies, wire dies for RBD, wire drawing dies, wire drawing dies for RBD Machine. We make Carbide nozzles for Sand blasting machines as well as for welding electrode industry , and spring manufacturing machines.. These carbide tools and nozzles have a long life as compared to conventional steel toolings. Where ever the extrusion process involves high wear resistance, carbide nozzles are used to impart long life and dimensional accuracy. - Manufacturers & Suppliers of precision Carbide Lined Guide Bushes and Sliding Head Collets for Swiss Type Automatic Machines, Sliding Head Automats, Auto Turning Lathes used in manufacture of precision turned components. - Guide Bushes and Collets executed in carbide and steel materials developed for optimal hardness and extreme wear resistance. - Carbide-lined Guide Bushes and Sliding Head Collets available in bore diameter starting from 1 mm up to 25mm with round, hexagonal & square bores, in standard or non-standard sizes as per specific orders. Collets and Guide bushes are used in the Sliding head machines for precision turned components. These are work holding devices which grip the drills, and rod for machining on the machine. We at Regal Carbide Dies Pvt Ltd manufacture collets and guide bushes in carbide lining. These collets are manufactured in round as well as square, hex and other shapes , assyemtric collets. As the speed of machine is high , there is regular wear and tear of collets and guide bushes. When the production of an item is for a very long period then in those cases , steel collets and guide bushes wear out very fast. To get over this problem we provide our clients with carbide lined collets. We are manufacturers of carbide lined collets and guide bushes. 3. Good surface finish on the turned component. We are manufacturers and exporters of these collets and guide bushes. 1. Tornos machine carbide lined collet manufacturers. 2. Star machine collet manufacturer. 3. Citizen machine carbide collet manufacturer and exporter. 4. 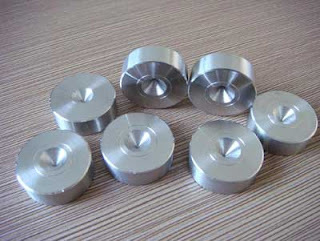 Behler machine carbide lined collet exporter and manufacturer. 7. Schaublin machine collets and guide bushes exporter.